Types of Characters/Creatures Allowed: Humans, Orcs, Elves, Dwarves, minor original species, player submitted species. Its has been over a thousand years since the fall of the great Demerian Necromancer King, Nevereen. The God Creator Kytos and his Divine Trinity have seemingly left the mortal plane, leaving the species of Aedisia to fight for power, territory, and control. Threats lurk in every corner as dark practices through Tainted Arcana resurface in the form of covens, cults, and abominations of the night. War drums boom across the Central Marches as legions and armies clash in conquest to dominate the city-states. Kingdoms and empires have risen and fallen, giving birth to new nations. It is time to carve your destiny, will you bring order to a world in chaos, or fuel the flame as you watch civilization burn itself to the ground. 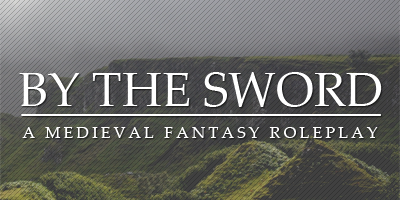 By the Sword offers endless opportunity for a player to develop their character from the ground up using a simple skill and inventory system. Aedisia is a world rich with original lore, offering players the opportunity to write to their liking while enjoying the canon plots and unique world wrapped in conflict. Player submitted lore is welcomed and encouraged. Main plots are sponsored and operated by staff, providing special rewards to those who participate. We are a new site, hoping to build our legacy on the works of our players.